A simple costings sheet is seen below. 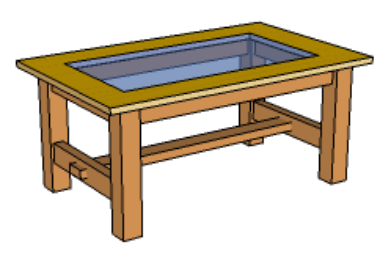 This outlines the cost of the parts (including materials, fixings and finishes) required to manufacture a small coffee table. The costings sheet is arranged into columns and rows. PART NUMBER: This can be a number such as 1, 2, 3 etc... or a catalogue reference code. Reference codes are often printed alongside products in catalogues, so that the supplier can identify accurately, what you are ordering. QUANTITY: The number of parts that you are ordering. For instance, if you are manufacturing a coffee table, you will only need one small tin of varnish. However, if you are manufacturing a hundred coffee tables, you will need multiple tins of varnish. DESCRIPTION: A simple written description of the part / product you are ordering. This helps the supplier understand what you are purchasing. UNIT COST: The cost of one of the parts / products you are ordering. For example, if you want one hundred tins of varnish, what is the price of a single tin? DISCOUNT: Some suppliers offer discount on certain parts / products. For instance, if you are ordering one hundred tins of paint, the supplier may offer ten percent discount (on the paint only). If each tin of paint has a unit cost of £2.00, one hundred tins would cost £200. However, with ten percent discount, you would save £20. This is the figure placed in the discount column. 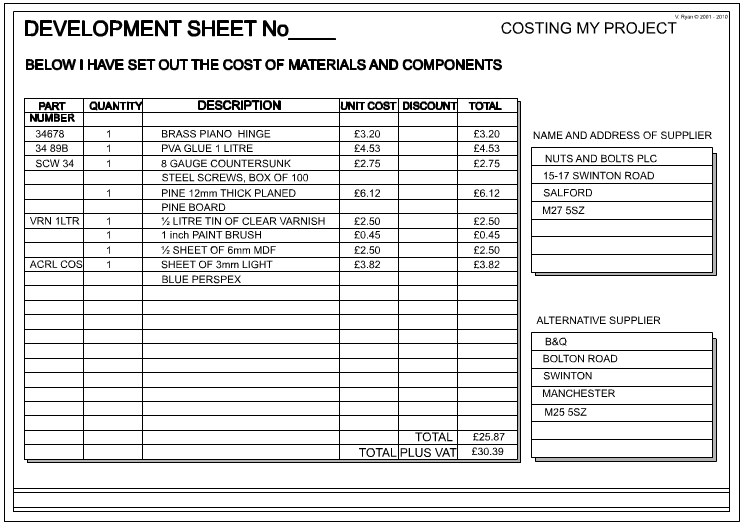 TOTAL COST: This is the final cost of the part / product you are ordering. 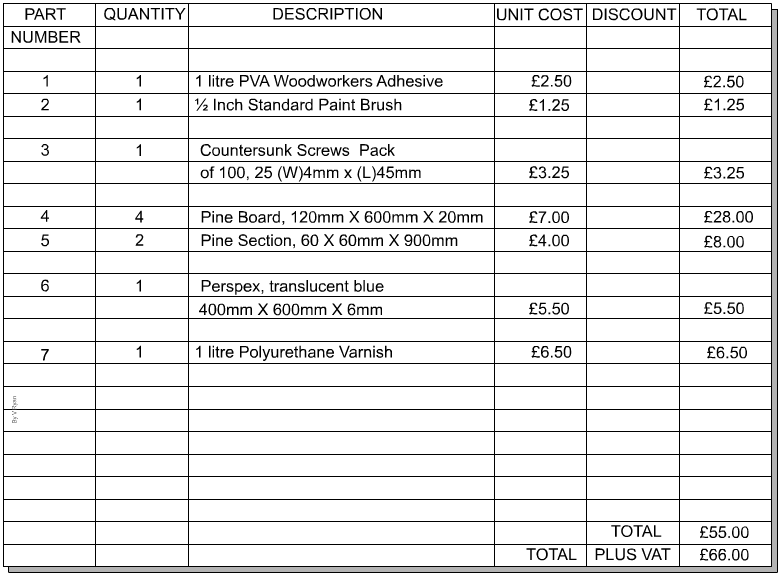 The costing sheet below, shows four pine boards being ordered. Each board costs £7.00. The total cost of four boards is £28.00. The Total Plus VAT (the final cost), is calculated by adding up the TOTAL column and then adding Tax (Value Added Tax, in the UK). For this example, a VAT Tax rate of 20 percent has been applied (VAT rises to 20 percent in January 2011). The calculation below shows how the TAX for the costings sheet was worked out. STAGE TWO: Add the tax calculated above, to the total cost. These are costs that do not increase or decrease as output fluctuates. For example, salaries of employees, rent for premises and advertising costs. These change as output increases and include such things as materials required to manufacture the product. If production increases then more materials are needed and consequently costs increase. EXAMPLE - Imagine you have designed a clock and intend to produce it on a large scale (called mass production). The costs would have to be calculated in detail before you could secure a loan from a bank which would allow you to set up the business/company. The table below suggests a method of setting out the costs. Complete the table above by filling in the total costs and unit costs. Costing a project with a view to producing it on a mass production line is an aspect of design work and you must present this as part of the development section of the design process. Having decided which of your ideas is the best, ‘cost’ its’ manufacture.